In addition to food poisoning, E. coli is responsible for causing most cases of urinary tract infections (UTIs). A close-up of E-Coli bacteria. 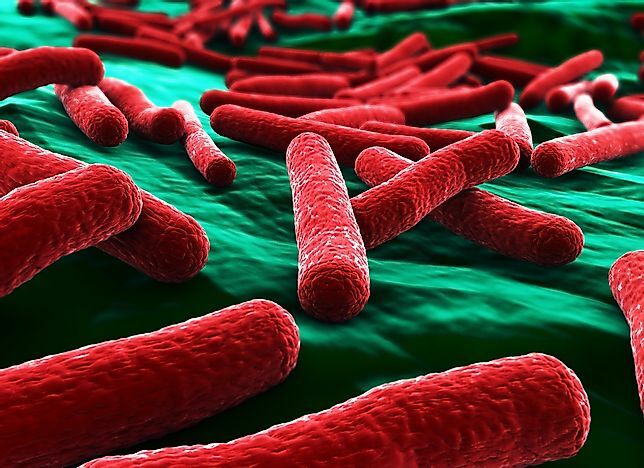 Commonly abbreviated as E. coli, Escherichia coli gram-negative bacteria that is shaped like a rod and is found in the lower intestines of endotherms or warm-blooded organisms. The bacteria has several strains although most of them are relatively harmless. However, some of them are responsible for serious cases of food poisoning in human beings. More than once, the bacteria has caused massive recalls of products by producing companies. In addition to food poisoning, E. coli is responsible for causing most cases of urinary tract infections (UTIs). On the other end of the spectrum, the harmless strains are found in the gut of their host and develop a symbiotic relationship by producing vitamin K while receiving protection. Also, the harmless strains can help prevent the more harmful strains from establishing themselves in the gut. Studies have shown that the bacteria form about 0.1% of the total gut constitution. The bacteria are capable of causing several diseases in both humans and animals. In humans, it may cause urinary tract infections, gastroenteritis, and neonatal meningitis. Sometimes it may cause pneumonia, hemolytic-uremic syndrome, mastitis, and a few others. Approximately 90% of all urinary tract infections are caused by the uropathogenic E. coli. The bacteria may infect the urethra and then ascend or slowly work their way up the urinary tract all the way to the bladder and then to the kidneys. For the case of men, the bacteria may work its way to the prostate. Since women have shorter urinary tracts than men, their chances of contracting a UTI are 14 times as many as for men. The effect is that people who are infected may experience symptoms such as painful bleeding, ejection of pus because of cell lysis, increased visits to the urinal, and other symptoms. In some rare cases, the infection might descend, that is, enter the upper body parts (such as kidneys and the bladder) of the urinary tract system. These bacteria may be introduced to these organs from contaminated blood. Basically, this is just food poisoning. Only certain strains emit toxins that cause food poison, and they may be introduced into the body through a number of ways. The most common means is by eating unwashed vegetables or eating undercooked or poorly butchered meat. Some of the strains are even capable of threatening the lives of those they infect. Historically, a serious outbreak hit the US in 2006 as a result of eating spinach. Again, in April 2006, there has been another outbreak that is possibly even bigger than that of 2006. Bacterial contagions are usually tackled with antibiotics. However, due to the different strains, different antibiotics are used depending on the diagnosis. The most common antibiotic is amoxicillin. Unfortunately, overuse of antibiotics by people has led to growing resistance by the bacteria. Also, these resistant bacteria transfer their resistance to other bacteria making it even more problematic to treat bacterial infections. As of 2009, a working vaccine had been developed and was awaiting a patent.